Experience the thrill of a lifetime in nature's paradise. 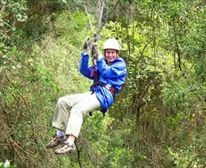 Experience one of South Africa's fastest growing eco-adventures with thousands of satisfied thrill-seekers having already caught the bug. 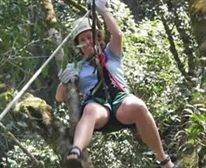 A Canopy Tour takes you on an unforgettable adventure as you slide from one platform to the next along a series of steel cables set amongst magnificent natural surroundings. The scenery high up within the forest canopy is spectacular. 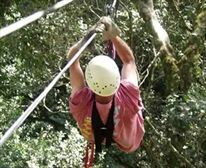 Enjoy the view from above while taking in waterfalls and spotting birdlife amongst the surrounding trees. Our professional guides will assure the safety of each group and point out interesting facts along the way. 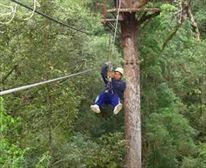 The Tsitsikamma Canopy Tour takes place in the magnificent Tsitsikamma indigenous rainforest. Many of the platforms are built around giant Outeniqua Yellowwood trees that are up to 700 years old! Standing within the crown of these giants and looking down at the lush forest floor thirty metres below is an experience of a lifetime. The scenery and birdlife is spectacular and professional guides ensure your safety while keeping you informed about interesting features of the forest ecology. If you are fortunate enough, you will spot a pair of Knysna Loeries or the brilliant red plumage of the elusive Narina Trogon. Whatever happens, we're quite sure you'll be back again! A first in Africa. Enjoy the unequaled beauty of the indigenous forest high up on ten treetop platforms. Gently glide along in a harness, on steel cables 30 meters above the forest floor. Birdlife is abundant (including Knysna Loeries and the elusive Narina Trojan), and your guides will explain the ecology of the lush primeval forest. Safety is paramount, and the system has been built to the highest civil engineering standards. Guides are fully-trained professionals. Duration: About 2 1/2 to 3 hours. Tours conducted in all weather conditions, but can be cancelled in the interest of safety. Ages from 7years to 70years. Maximum Weight Limit: 120kg / Pregnant ladies not allowed to take part in excursion. Duration: 2 1/2 to 3 hours. Tours are conducted in all weather conditions, but can be cancelled in the interest of safety. Bookings essential (All ages) / Subject to availability. A 11km guided hike in the spectacular indigenous Plaatbos Nature Reserve. Birdlife is abundant (including Knysna Loeries and the elusive Narina Trojan), and your guide will explain the ecology of the lush primeval forest. Ideal for Team building the obstacle course provides a number of diverse challenges! Low ropes includes a number of obstacles at 1 meter above the ground. 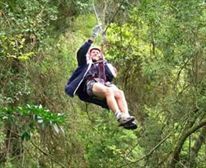 High ropes provides a series of challenges at 8 meters above the ground. A total of 15 different obstacles is ideal for facilitated team building which can be tailor made to the groups requirements. Professional facilitations is provided in accordance with the groups outcome objectives. Ideal for corporate team building. A 2km boardwalk hike surrounded by indigenous plants and trees on route to a spectacular 800 year old Outeniqua Yellowwood tree. Please note: No advance bookings required. Ten international tourist publications have rated the Tsitsikamma Eco Wilderness Boat Cruise a "must", and German and British Television have both featured the cruise. Awesome cliff faces tower 150m above the boat, as it passes huge 20m caverns along the river. Fish-Eagles, Giant King Fisher and Knysna Loeries soar above. The boat cruise is the only way to see the inaccessible Stormsriver Gorge. Hiking duration to and from the suspension bridge - 1 hour. Boat Trip Duration: 30 minutes. Departs from the Suspension Bridge in the Tsitsikamma National Park. Starting times 09H30 - every forty five minutes. 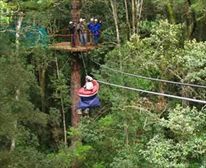 WHERE: Tsitsikamma, South Africa CONTACT US NOW TO BOOK YOUR CANOPY ADVENTURE!! including light refreshments & Guides. Rates are subject to change without notice.